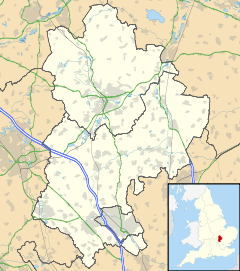 Blunham is a village and civil parish in the Central Bedfordshire district of Bedfordshire, England, about 8 miles (13 km) east of Bedford. The village is just off the A1 road, near Great Barford and Sandy, and is near the confluence of the River Ivel with the River Great Ouse. The village also lies on Route 51 of the National Cycle Network. At the north of village is an unusual double humpback bridge across the River Ivel and the Mill Stream which must be crossed to enter the village from the A1 road or Tempsford. Blunham is an ancient parish and part of the hundred of Wixamtree, which had become disused by 1900. The first mention of a post office in the village is in 1839, when the village had a Penny Post service under St Neots. The post office national archives record the issue to Blunham in August 1886 of a type of postmark known as a rubber datestamp. The village post office closed in October 2008. It was one of about 2,500 compulsory compensated closures of UK post office branches announced by the Government in 2007. Blunham had a railway station which opened in 1862 on the Oxford to Cambridge railway line. The station shut when this line was closed in 1961, although the station buildings still exist and have been converted into two homes. The old railway is now used as part of Route 51 of the National Cycle Network. The route heads east towards Sandy and west towards Willington and Bedford. The church of St Edmund has a massive but delicate tower built of sandstone and limestone. From 10:00 am Thursday 26 August to 7:00 pm Monday 30 August 2010, two teams of Cricket players from the Blunham Cricket Club (BCC) played in all weather to set a new record for a continuous game of Cricket. 105 hours were played continuously, playing through a months rainfall in just 4 days, going through four consecutive nights. Until 2015, Blunham operated a senior football team within the Bedfordshire County Football League. The younger teams still participate in the Bedfordshire leagues. John Donne, poet and preacher, was rector of the church from 1621 until his death in 1631. Andy Holden (artist) (born 1982) lived in Blunham as a child, and studied at Goldsmiths, University of London and has exhibited at Tate Britain. George Joye was given the Rectory of Blunham In September 1549 by Sir Henry Grey of Flitton. ^ "Civil Parish population 2011". Neighbourhood Statistics. Office for National Statistics. Retrieved 5 November 2016. Wikimedia Commons has media related to Blunham. This page was last edited on 2 February 2019, at 17:42 (UTC).